Please visit the Community Center and see the newly remodeled Large Room. For booking information call 423-867-6406. The Arena 34,000 square-foot facility that is home to events all year. Amphitheater Large stage with fenced-in field that holds more than 10,000 spectators and serves as a venue for concerts, including J-Fest. Baseball Fields Camp Jordan has 13 professionally manicured baseball/softball fields located at I-75, Exit 1. The Quad Four full-size baseball fields with grass infields and 300-foot plus fences. Training Facility A turf, indoor facility offering hitting cages, pitching machines and room for pitching training. Soccer Fields Eight full-size Bermuda fields and a stadium that seats 3,500 and has broadcast-quality lights. Curtis Adams' Pavilion Located at Pioneer Frontier on Tombras Ave.
Camp Jordan Playground The kids love to come to Camp Jordan to play on the park playground. The Pioneer Frontier Pioneer Frontier is a fun park for children. Its located on Tombras Ave. and is lit up at night. Springvale Park A beautiful green space along the Chickamauga Creek on Springvale Ave.
Community Center The Large Room is a one-of-a-kind meeting place. You have to see it to appreciate it. Camp Jordan Track Two-mile, paved track for walkers, runners and cyclists to do their thing. Dickert's Pond A catch and release 2 acre lake. 2019 Spring baseball/teeball -Info and schedules. Find all info here that you need for signs ups and season schedules. 2019-2020 Indoor Soccer Schedule. Please click on the picture. Like and follow our Soccer Club on Facebook for important updates. Check here for an up-to-date soccer schedule for u12-u19 weekly travel schedule. The East Ridge Futbol Club is a member of Tennessee State Soccer. 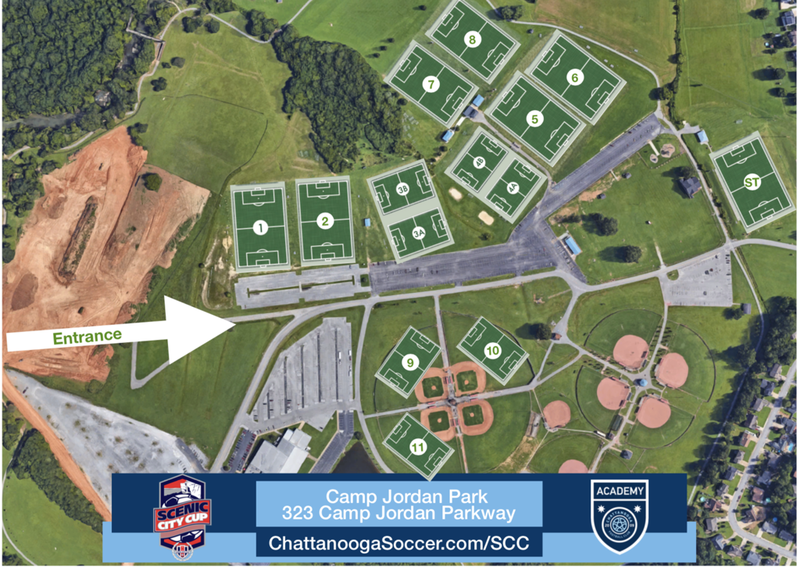 More than 2,500 soccer players at Camp Jordan play with Tennessee State Soccer. East Ridge Parks and Recreation plays Dizzy Dean baseball and softball. A look at Camp Jordan baseball/Softball Fields by air. The beautiful Camp Jordan Park has a variety of fun and recreation opportunities for people of all ages and lifestyles. "The Pride of East Ridge, Tennessee" is a 275-acre park operated by the East Ridge Parks and Recreation Department. Camp Jordan is one mile off I-75, Exit in Southeast Tennessee and one mile from the Georgia state line. @CNBaseball Good stuff _ many should take advantage of this. baskin robbins welcomes you to Camp Jordan. We are a short drive up Ringgold Road. A special rate has been negotiated for Camp Jordan events. We are located only 2 minutes from Camp Jordan and within walking distance of many restaurants. We are pleased to have Academy Sports + Outdoors as a Sponsor for our Sports programs. Conveniently located in East Ridge and less than 2 miles from Camp Jordan Park. Our hotel has free WiFi, and microwaves and refrigerators are available also an outdoor pool.